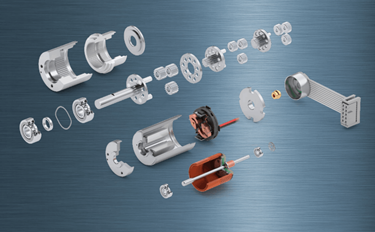 maxon motors offers an outstanding line of DC motors featuring no magnetic cogging, low electromagnetic interference, low inductance, high efficiency, and high acceleration due to low mass inertia. These motors offer linearity between voltage and speed, load and speed, and load and current. The motors’ small, compact designs allow them to bear high overloads for short periods of time, and deliver small torque ripple via multi-segment communicator. The DC motors are manufactured with maxon’s patented ironless winding system. Multiple combinations are possible with gears, as well as DC tachometers and encoders. The optimal operating speeds are between 4000 rpm and 9000 rpm, depending on the motor size. At constant voltage, the speeds are reduced with increasing loads. At lower speeds, a gear combination is often more favorable than a slowly turning motor. A good adaptation to the desired conditions is possible through a variety of available winding variants. For more in-depth information on the various types of DC motors, download the catalog above. DC motors are featured on page 38.